Ladies and gentlemen, the plot thickens once more thanks to our new best friends at EW. 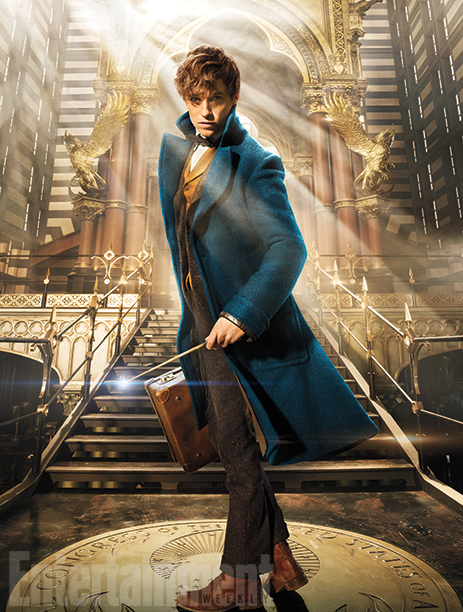 Eccentric magizoologist Newt Scamander (Oscar winner Eddie Redmayne) comes to New York (for a reason we won’t disclose) with his trusty weathered case. This case is one of those way-way-way-bigger-on-the-inside magical devices, and within are expansive habitats for a collection of rare and endangered magical creatures from Newt’s travels around globe. He discovers the American wizarding community is fearfully hiding from Muggles (who are called “No-Maj” in the States, more on that here) and the threat of public exposure is an even graver concern than in the UK (remember the Salem witch trials?). Fantastic Beasts is the story of what happens when this uniquely skilled English wizard travels to wiz-phobic America and a variety of his creatures, some quite dangerous … get out of their case. I have to say, this story sounds like every Hufflepuff’s dream! We start off with a magizoologist toting his Mary Poppins-TARDIS-like-briefcase full of intriguing creatures, and when his curious nature (and willingness to FIND new animals and habitats) brings him to America where there’s no love for magical folk, he wants to do what he can to be of service. I’m loving this plot, although it’s not at all what I was expecting it to be. Less following Newt’s travels and more seeing him in action in one area, but who am I to complain when the story sounds so interesting? On top of major synopsis details, we’ve also learned a bit about our main characters and their powers, or lack-thereof. Alongside Newt we have Tina, the ambitious and good-hearted MACUSA employee, Queenie, the free-spirited mind reader, Jacob, the optimistic No-Maj, Graves (Colin Farrell!) the badass American auror, Mary-Lou, the fanatical wizard-hater, and Credence, Mary-Lou’s troubled, adoptive son. So many updates it’s hard to keep up, and I wouldn’t have it any other way. Magical news continues to pour out of the treasure trove of awesome that is Entertainment Weekly. Here are a couple of the “first looks” they’ve revealed so far from their latest issue, on newsstands this Friday. Katherine Waterston as Porpentina “Tina” Goldstein, Eddie Redmayne as Newt Scamander, Alison Sudol as Queenie Goldstein, and Dan Fogler as Jacob Kowalski. And a dashing shot of Newt inside the entrance of the Magical Congress of the United States of America, the American sister to the Ministry of Magic. From what we’ve seen so far, Fantastic Beasts will truly have the look and feel of the stories we already know, but with a more mature and, well, American twist to it. I’m so in love with the idea that the Potter franchise is working to appeal to it’s lifelong fans with a new story set outside of a wizarding school, following a character we’ve for so long wanted to learn more about. Now to wait for a teaser trailer! See the rest of the EW images here! With all of the Cursed Child hubbub these past few weeks, non-UK Potterheads have felt a little disappointed and left-out in the fandom. Sure, it’s exciting to have an official eighth part of Harry’s story, but who knows when we’ll even be able to witness it for ourselves. Most of us are going to have to rely on the lucky few who are able to attend the production to give us the details secondhand. Secondhand fans, psh. Can you tell I’m down in the dumps about it? 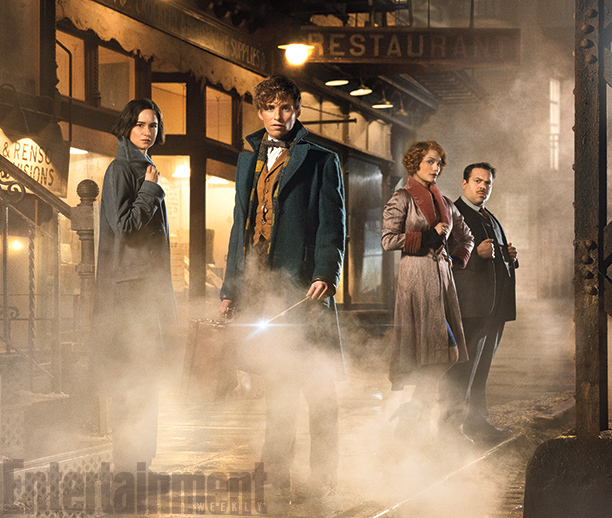 Alas, along comes Fantastic Beasts to fill our souls with magic yet again. 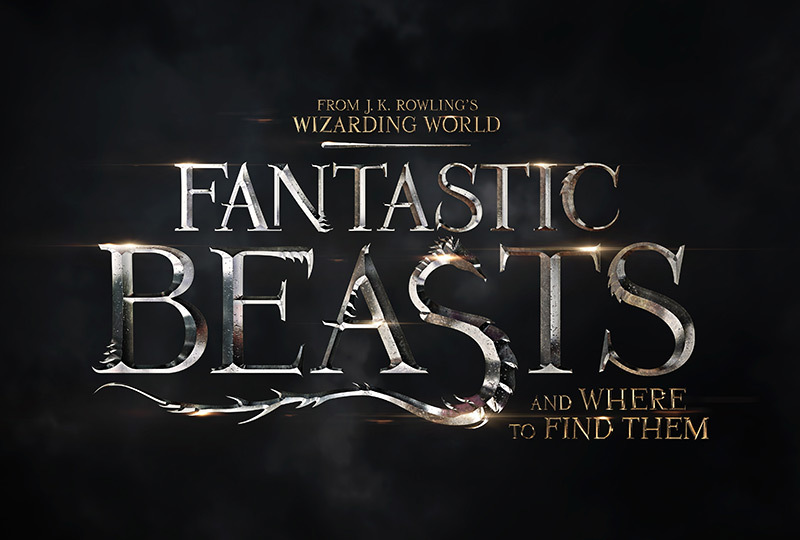 EW has released an exclusive look at the Fantastic Beasts and Where to Find Them title image, and it’s incredible. Hearkening back to the title cards of old (Potter films 1-8) with the color treatment and design, we’re given a taste of the past as well as a look into a brand new chapter from Rowling’s wizarding world. And that dragon “s” is just plain cool. And for the cherry on top, the Fantastic Beasts website and social media accounts are now live. Pottermore has also chimed in on the logo, with their interview with the very designers who crafted the image. What do you think of our first glimpse at the new film? Very Harry Potter-esque. Can’t wait for it! Previous Previous post: Happy Birthday, Sirius!